What if the man you’ve always loved isn’t the right one for you?Rose Atwood has been in love with her best friend for years, and she’s tired of keeping her feelings under wraps for fear of getting hurt. Being Tyler's best friend is becoming more difficult with every passing year and every new woman in his life—especially Georgiana Smithson, a snotty, beautiful girl who’s in Law School with them.When Rose, dumped by her long-term boyfriend, moves temporarily into Tyler’s apartment, tension spikes. Georgiana wants Rose out of the house. Rose wants Georgiana out of Tyler’s life. And Tyler… well, he doesn’t really know what he wants. As an unexpected argument brings Rose and Tyler closer than they’ve ever been, they must decide if there’s more to their relationship than being just friends. And they must do it quickly, as Georgiana is determined to do everything in her power to keep Tyler and Rose apart. After all, all is fair in love and war. Will Rose make a leap of faith and trust Tyler with her heart?Will Tyler make the right choice, or will he be too late? 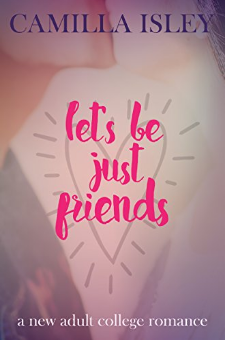 ***Bonus Scenes Added***Let's Be Just Friends is a fast paced, captivating college romance that will keep you glued to the pages with humor, heartbreak, and romance. It's a story about friendship, love, and the choices we make.Tyler and Rose are two best friends, who end up tangled in a college love triangle when they become friends with benefits. Enjoy this light new adult read.